Most folks who observe Texas politics and government are pretty much in agreement with the late, great Molly Ivins. Texas government is a spectator sport. That being said, The Main Thing that a writer must remember is that at the local level most people write about--Everybody's elected. All the bosses are, anyway. And there is no such thing as a concentration of power. Or even a city school district. The schools--and sometimes the utilities, and other stuff I'm not remembering right now--are run by their own independently elected board of trustees. As are the junior colleges. The four-year state colleges have appointed boards, and there are a few other state-level committees and boards that are appointed. But the State Board of Eduction is elected. The Railroad Commission--which does regulate railroads and transportation, but more importantly, is in charge of mineral licensing and how much oil, gas, etc. can be taken out of the ground--is elected. However, who's going to write about the Railroad Commission? Well, maybe somebody will come up with a great way to bring them into a murder mystery that starts with corruption in the commission and links to Big Oil and wildcatters and... Go ahead and use that one. My brain hurts already. The main thing to remember is that Everybody's Elected. I mean, EVERYBODY. Which makes for a lot of peculiarities. I've lived here all my adult life, so I'm used to it. Every school district is an ISD (Independent School District), so there's GISD for Galveston Independent School District, and FWISD for Fort Worth Inde-- etc., etc. And MUD stands for Municipal Utility District. How did we get this way? Well. It all goes back to the Civil War. Texas was a part of the Confederacy. Secession was not unanimous. Sam Houston was one of the most prominent of those opposed to leaving the United States but his attitude didn't prevail, and he was deposed as governor and dropped from polite society. Very little of the Civil War took place in Texas. 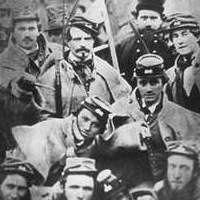 Mostly Texas participated by sending Hood's Texas Brigade and a lot of other soldiers. Galveston was briefly occupied by the Union Army and the Battle of Palmito Ranch down near Mexico was fought after Lee surrendered, and that was pretty much it. However, during the Civil War, the Comanche pushed back the frontier and a number of forts were abandoned, among them Fort Fisher along the Brazos River near Whitney where I used to live. It was pushed back clear to Fort Parker, a Texas Ranger fort also along the Brazos in Waco, where the Texas Ranger Hall of Fame is today. Check the map. This is the middle of the state. The Rangers protected the settlers from the Comanche and the outlaws. Then the war was over. It took a while for word of it to reach Texas. The Emancipation Proclamation was read to slaves in Texas for the first time at Ashton Villa on Galveston Island on June 19, 1865. 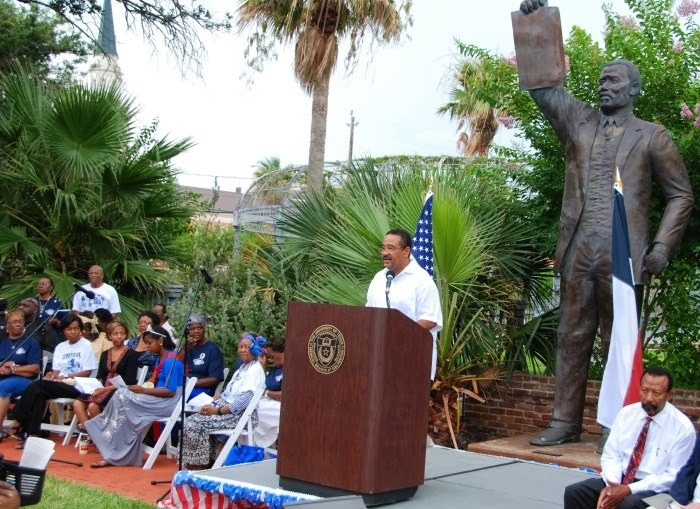 Juneteenth is still celebrated in Galveston by reading the proclamation at Ashton Villa, then everybody walks over to the park for a party. The local folks want to make it a national holiday... at least on the level of Flag Day. Reconstruction began with Lincoln's gentle version at first, but the Radical Republicans, as they called themselves, had trouble with wholesale forgiveness and they truly wanted to make the freed slaves equals. A lot of them did, anyway. 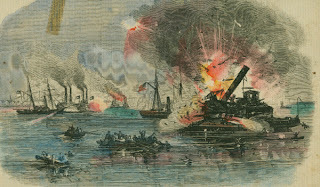 And when they took over Congress in 1866, they sent in troops to occupy the rebel states and made enemies. It was kind of a cold war. In Texas, which suffered somewhat less than the other states because there was less destruction of property than in, say, Atlanta, Edmund J. Davis was elected governor under a new, Reconstruction-created constitution. He was an ally of Sam Houston's in the secession argument and left the state after they lost the argument, joining the Union Army and creating a regiment of Unionist Texans. He truly believed in the cause of emancipation. But he may not have been the most politic of men. He made a lot of enemies. He disbanded the Texas Rangers, which made him a lot of enemies right there, and created the Texas State Police. A lot of the State Police were former Rangers and became Rangers again after the State Police were disbanded and the Rangers reconstituted. The chief of the state police embezzled a ton of money (especially for that era) and a lot of the crimes they enforced were white-on-black crimes, which did not endear them to the unregenerate Confederates. Texas was readmitted to the Union in 1870, the last state except for Georgia to be officially admitted, and Georgia was only three or four months behind. It operated under that Reconstruction constitution, which went into force in 1869, until the election of 1873 when Ed Davis lost in an election that abounded with irregularities. 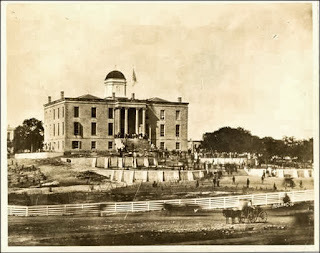 Because of all those irregularities, he barricaded himself in the capitol (not the current state capitol, but the one they had before, called the Old Stone Capitol. I think it burned down, but anyway, it was replaced.) and folks broke out ladders to climb in the windows. Okay, so Davis is out. The federal troops are out. Texans don't like the constitution they feel was forced on them during Reconstruction, so they convene a new constitutional convention to write another one. They didn't like Davis or the way he governed. They didn't like the government telling them what to do. The way they figured it, the best way to keep control of those interfering government folks was to make as many of them as they could get elected regularly, keep the legislature from meeting very often, and take as much of the power away from the governor as they could. So that's what they did. The Texas State Constitution is the third longest state constitution, shorter only than that of Alabama (which has been amended 800 times) and California (which has to deal with that citizen initiative thing). It is a prescriptive constitution, meaning that there is no "Necessary and Proper" clause as in the U.S. Constitution. Only the things prescribed in the constitution are allowed. It has been amended over 475 times (that was the count in 2010, and I know we've passed up to a dozen amendments in pretty much every election since) (Including just county elections--the state tends to tack them on), sometimes a specific amendment for a specific county. The governor is one of the weakest in the country, many of his powers divided with the lieutenant governor, because the folks who wrote the current constitution hated Ed Davis and didn't want any governor forever after to have the kinds of powers that Davis had. So, the lieutenant governor runs independently of the governor and appoints nearly as many positions on the various executive boards as the governor does. These boards do a lot of the running of the state. The lieutenant governor is the presiding officer of the Texas Senate, has that as a power base as well. He or she is not always of the same party as the governor. Remember, they do not run as a "set." 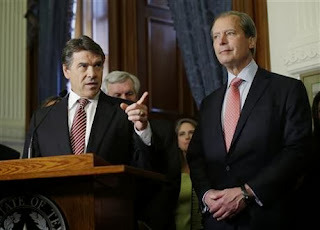 The current LG, David Dewhurst, is a bit of a nonentity and not considered terribly effective, while Governor Rick Perry has been in office longer than any other governor, ever. His longevity has given him more power than governors have usually had. But when George W. Bush was governor, he had a powerful Democrat as his lieutenant governor and believe me, Bob Bullock exercised that power. Personalities still do count. Besides requiring the election of everybody from constables, justices of the peace, judges at every level (including the Supreme Court and Court of Criminal Appeals--which are each the supreme court of the state, one for civil cases only and one for criminal cases only), county tax assessor-collectors, to Texas Education Board members and Railroad Commissioners, those government-averse Texans of 1873-ish decided that the less the legislature met, the less it could mess things up. So the Texas Legislature meets only once every two years, beginning in January of the year following the election, for 140 days, usually ending in late May or early June, depending on when, exactly, they started. Legislators and state senators are elected in November, every two years, and in January, they convene in Austin. The governor can call special sessions for specific purposes, and those special sessions last for only 30 days. In 2013, Governor Perry called two special sessions in a row immediately after the regular session ended and totally pissed off the legislators. They wanted to go home and get back to business. 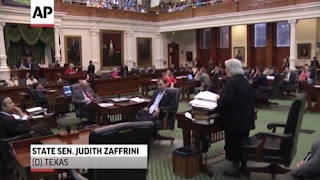 Because the Texas Legislature is so very part time, it tends to be popular with lawyers, insurance agents, doctors, homemakers, and others among the self-employed. But even they eventually need to go back to work. This is definitely just a skim-over of how government (at the state level) works and how it got this way. I used to teach this stuff at the college level and it took a good quarter of the semester to cover just the historical stuff. It's probably not something you will need to know except for deep background, but it's a good stuff to be aware of. Texas doesn't work like other places. I don't know any other state in which the legislature meets only once every other year. Or that has quite so many elected officials. Or where neither the city nor the county has anything to do with the schools. Just remember, if you're a school kid researching Texas government--leave now and go find a more official site. Or if you're a writer working on a murder mystery about corruption in big oil, leave now and go look up the Texas Railroad Commission. Because this isn't official, nor is it complete. Now, go forth and research.